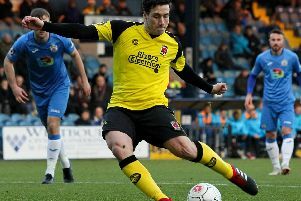 High drama at Victory Park kept a crowd of 1,125 on tenterhooks in a second half accurately described by Chorley boss Matt Jansen as ‘frenetic’. But 10-man Chorley finally emerged with three well-earned points in this National League North encounter. Earlier a routine home win had looked on the cards as the Magpies, often producing eye-catching approach work, dominated the first half. But after two coolly taken goals, the chance to wrap up the proceedings with a third from a penalty before half-time was missed. And two Telford goals in five minutes shortly after the interval, plus a sending-off, completely changed the complexion of the match. But with typical determination the Magpies regrouped and fashioned a superb third goal on the break to regain the lead. Chorley went ahead after 10 minutes, Jason Walker pulling the ball back for Josh Wilson to find the corner of the net with a low drive. The Magpies’ control of the game was underlined by a second goal on 32 minutes. Josh O’Keefe met a deep cross with a neat pull-back for Marcus Carver to roll the ball just inside the near post. Carver was in the thick of the action again only to be tripped as he turned inside the box but Walker’s penalty placement lacked power and Jasbir Singh got down quickly to save. The Magpies were made to pay soon after the break. Adam Anson was dispossessed was sent off for shirt-tugging. Marcus Dinanga scored from the spot. And Chorley were soon undone again when the big striker thundered a header past Matt Urwin from a corner to bring Telford level. Chorley were rocking at this stage but the 10 men weathered a brief storm before crucially regaining the lead in the 66th minute. A lofted through-ball from Wilson released Carver, who drove the ball low past Singh. CHORLEY: Urwin, Challoner, Blakeman, Teague, Leather, Anson, Haughton (Jarvis 76), O’Keefe, Carver, Walker (Hughes 83), Wilson (Roscoe 90). Subs (not used): Beesley, Charnock.